December 13, 2015, Sr. Denise A. Roche, Grey Nun of the Sacred Heart, and President of D’Youville College (where the Pre-Novices study) was named an Honorary Oblate of Mary Immaculate by Fr. Louis Lougen, OMI, Superior General of the Oblates. Archbishop Emeritus Harry J. Flynn was installed as an Honorary Oblate in the United States Province of the Missionary Oblates of Mary Immaculate October 30, 2011. His service was held at Christ the King Retreat Center in Buffalo, MN. The U.S. Provincial Fr. William Antone, OMI, presided. The honor was bestowed upon Archbishop Flynn, retired archbishop of the Archdiocese of St. Paul and Minneapolis, by the Oblates in response to his exceptional commitment to the Missionary Oblates for several years. 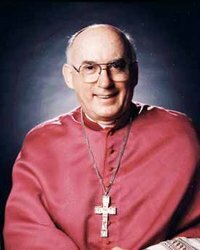 Archbishop Flynn previously served as the Coadjutor Archbishop of the Archdiocese of St. Paul Minnesota in 1994 under the leadership of Archbishop John Roach. In 1995, he succeeded Archbishop Roach. Father Jim Deegan, OMI has worked with Archbishop Flynn at the Christ the King Retreat Center in Buffalo, MN many times in the past. He can still recall the impression Archbishop Flynn left on him and the Oblate community shortly after being named Archbishop. Father Deegan met him a year before his succession as archbishop, but he said he became more familiar with Archbishop Flynn’s charism in the summer of 1997. He encouraged the expansion of retreats and even provided donor contacts for fundraising, something that was not normally offered. Archbishop Flynn has since held several retreats at Christ the King Retreat Center and has been heavily involved in the Oblate Partnership. Fr. Deegan said that he has demonstrated what he believes an Oblate should be. The title of Honorary Oblate of Mary Immaculate (HOMI) is the highest mark of esteem the congregation of the Missionary Oblates of Mary Immaculate can bestow on a non-Oblate. The first Honorary Oblates were named by the founder of the congregation himself, St. Eugene de Mazenod, in 1842. 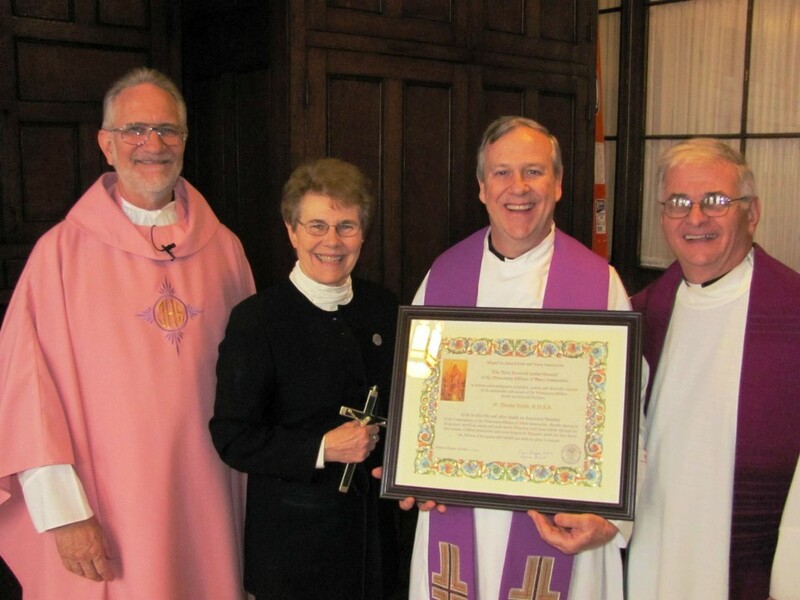 An Honorary Oblate receives the profession cross of a deceased Oblate of his or her choosing and a calligraphic certificate noting the honor, and shares in all the spiritual benefits of membership in the Oblate congregation. 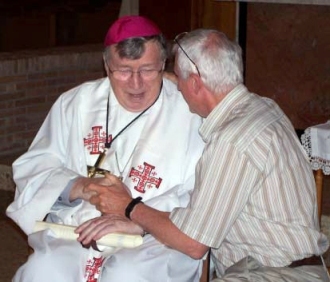 Honorary Oblates are proposed to the Superior General by a provincial superior, who provides written recommendations and evidence of the person’s personal identification with the ideals and goals of the congregation. Fr. Deegan said that the personal characteristics he has seen in Archbishop Flynn are what stand out the most. On Sept. 11 Fr. Wilhelm Steckling formally invested Bishop Thomas J. Flanagan as an Honorary Oblate of Mary Immaculate during a Mass in the Oblate School of Theology’s chapel. Fr. Warren Brown, OMI, presented the recommendation for the honor, saying, “Today, we present Bishop Tom Flanagan, a compassionate, big-hearted, loving priest of God, whom we honor as a son of St. Eugene and a brother in Oblate community life.” Bishop Flanagan was presented with the Oblate cross of the late Fr. Angel Villalba. Born in Spain, Fr. Villalba served as a missionary in Africa and spent more than 20 years in ministry in Corpus Christi, TX. He died in 2008.